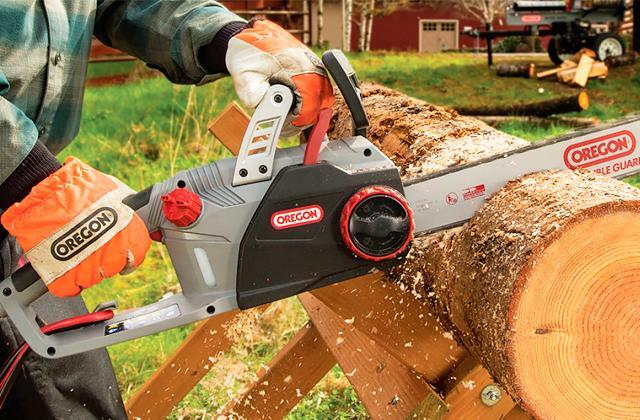 The built-in generator allows for charging the battery during the cutting. The twin blade provides fine mulching thanks to MicroCut System®. The bag may get clogged when you cut wet grass. 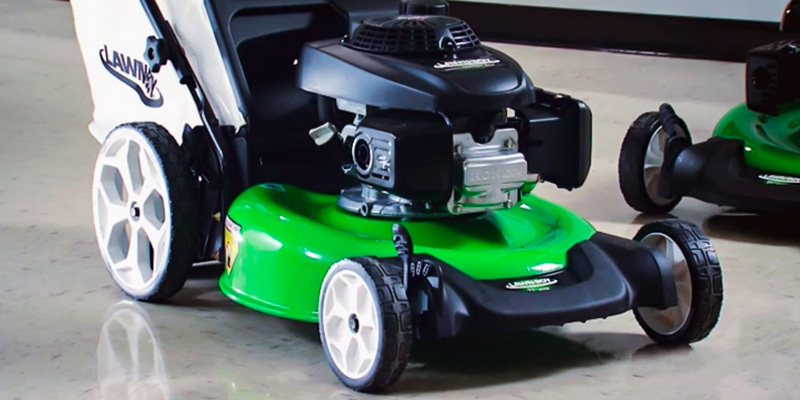 This self-propelled electric lawn mower has pretty good characteristics and is able to cut through the grass on sloped and bumpy grounds up to 1 acre. 6 positions from 1.125" to 4"
Front and rear wheels - 8"
Big rear wheels provide good stability and passing ability. The cutting deck is the widest among competitors and covers a lot of grass at a time. You will need an accessory tool for filling the engine with oil. This Poulan Pro self-propelled lawn mower is an excellent assistant for clipping of grass of whatever kind on lands of 0.5 acre and more. 9 positions from 1.25" to 3.5"
Front wheels - 8" Rear wheels - 12"
The engine is low-noise, so working at night is enjoyment. Tri-Cut system of the blade provides fine grass mulching. The plastic levers for cutting height adjustment seem to be unreliable. This self-propelled lawn mower will be ideal for trimming of small and medium lawns up to 0.5 acre. 6 positions from 1.25" to 3.75"
Front wheels - 7"Rear wheels - 8"
TriAction® blade is 3 times more effective than conventional blades. 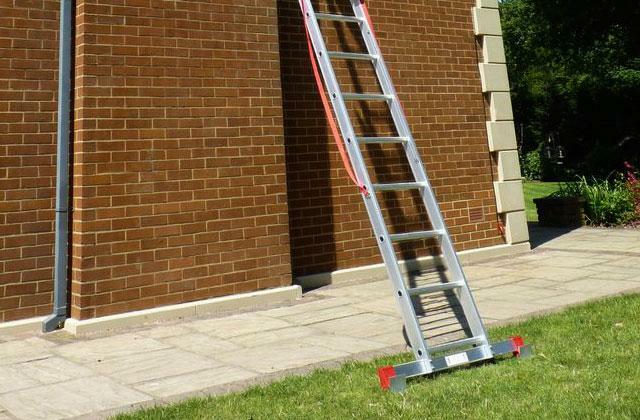 The cutting height can be adjusted with one lever quickly. 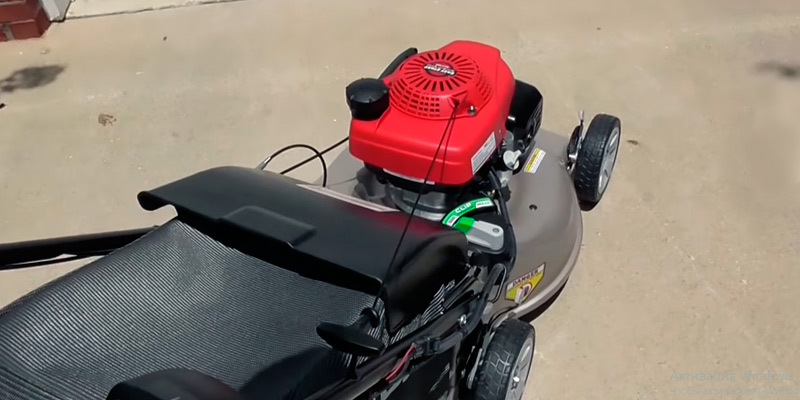 This self-propelled petrol lawn mower will help you get rid of grass, as well as small shrubs and weeds thanks to a highly powerful engine. The lawn mower comes ready-to-use and needs no assy. The engine needs a diligent care. 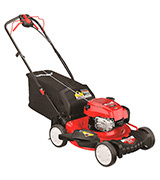 The features of this lawn mower make it applicable for complex lawns with tall grass or weeds. The mower will perform most effectively on the areas from 0.25 to 0.5 acre. Front wheels - 8" Rear wheels - 11"
Being equipped with the Honda GCV160 engine of 4.4 HP, this self-propelled electric lawn mower is highly efficient. This engine will cope with any grass - dry, coarse, wet and thick. The rear wheels drive, so the mower adheres to the ground well. 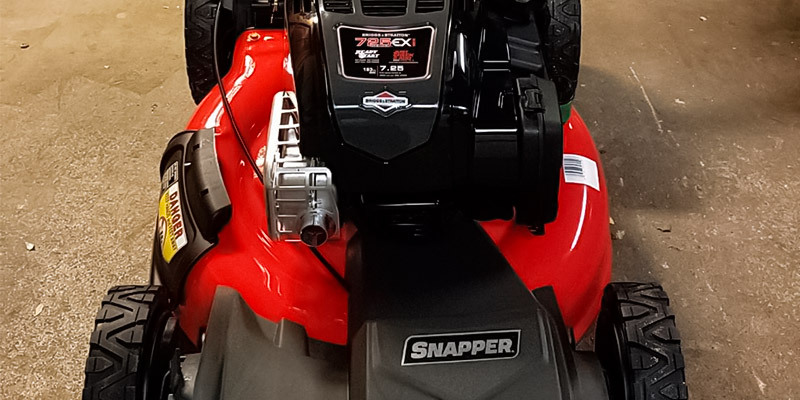 Moreover, the rear wheels bear a major part of the weight, so they don't slip on wet grass, and the mower runs smoothly in any weather conditions. 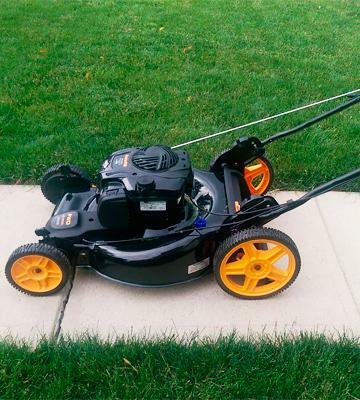 Each wheel is 8" in diameter, so this lawn mower will behave confidently on both level and bumpy lawns. 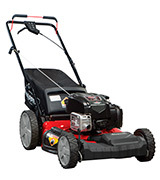 The 21" cutting deck and the high-speed engine able to make 3600 rpm and provide quick and efficient mowing. The specially designed Microcut® twin blade provides more efficient and finer mulching of grass as compared with standard blades. The cutting height can be adjusted to 6 positions from 1.125" to 4". The height of each wheel can be adjusted separately too. The grass bag can hold up to 1.9 bushel of grass, so you can work for a long time and trim a medium-sized lawn without cleanup. The mower can reach the speed up to 4 mph, so it will cope with most heavy-load jobs pretty fast. To sum up, all these features provide quick and effective cutting on areas up to 1 acre. 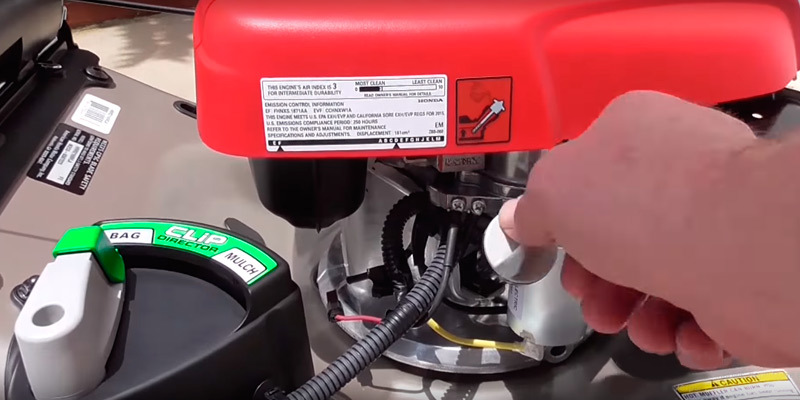 The self-charging electric start system is the main peculiarity of this lawn mower. 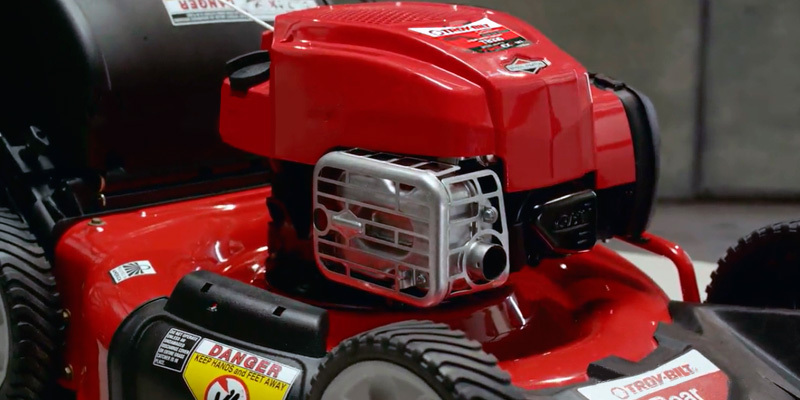 Start the engine with a single turn of the ignition key and go mow while the battery gets charging during the progress. The Smart Drive control allows you to set the ground speed at 5 different positions and tailor it to your stride by applying more or less pressure to the paddle levers. In addition, the handle can be adjusted to 2 height positions, and it is covered with a foam material for a comfortable grip. 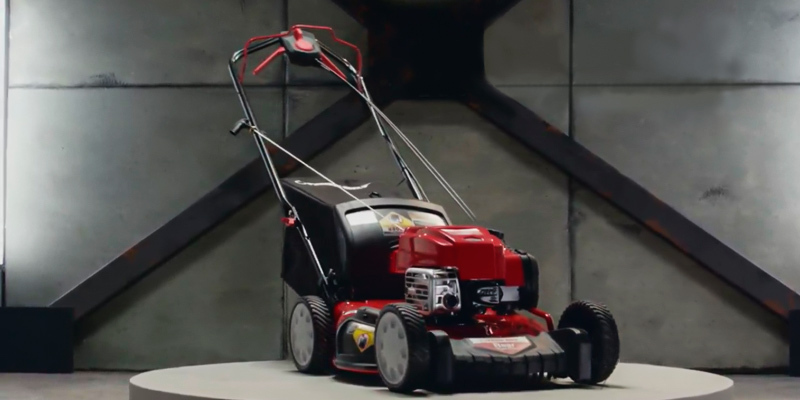 What is more, this mower features technologies that ensure safe of use and facilitate maintenance on the whole. The flywheel brake will stop the engine and blades the moment you release the blade control lever. Accordingly, this feature helps you save blades from damage when, for example, tripped over a stone. The intelligent Auto Choke System sets the choke automatically to guarantee optimum start and smooth operation under any cutting conditions. Finally, the foldable handlebar will let you store and relocate the mower conveniently. 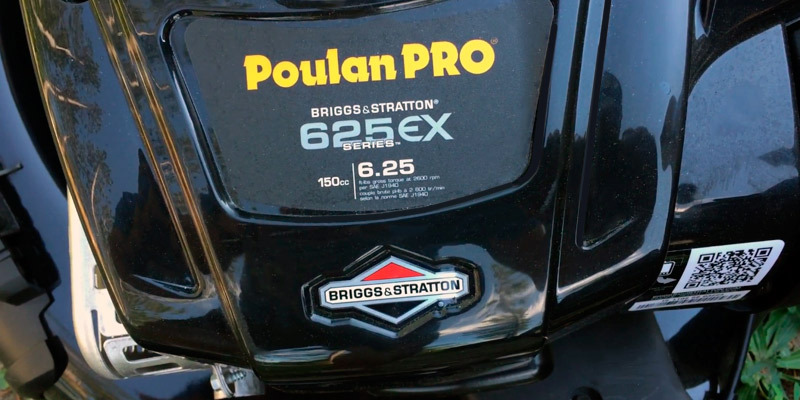 The Poulan Pro PR625Y22RHP is a self-propelled petrol lawn mower of a front-wheel drive. Such a design provides its high maneuverability and applicability to complex lawns with plenty of obstacles such as trees, benches, fountains, etc. The 12" rear wheels will surmount hummocks easily and let you guide the mower effortlessly. 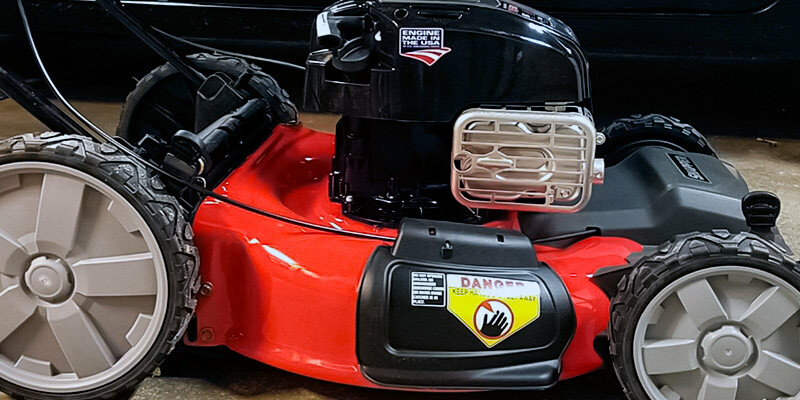 The 4 HP engine manufactured by Briggs & Stratton is highly efficient and provides high performance of the cutting gear. 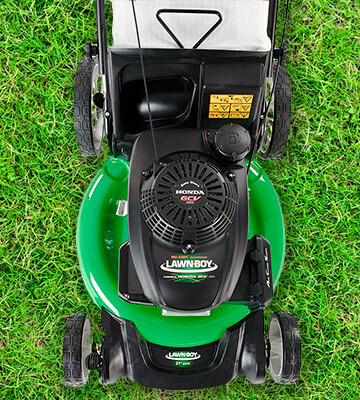 This lawn mower features adjustable cutting height that can be set to 9 positions from 1.25" to 3.5" with 4 convenient adjusters. This option enables you to pick the best suitable height for the grass in your backyard. The long blade provides high-quality cutting, covering a plot of 22" in a single pass. The grass bag capacity is 1.9 bushel, so the bag can collect a pretty big amount of clippings while allowing you to work longer. 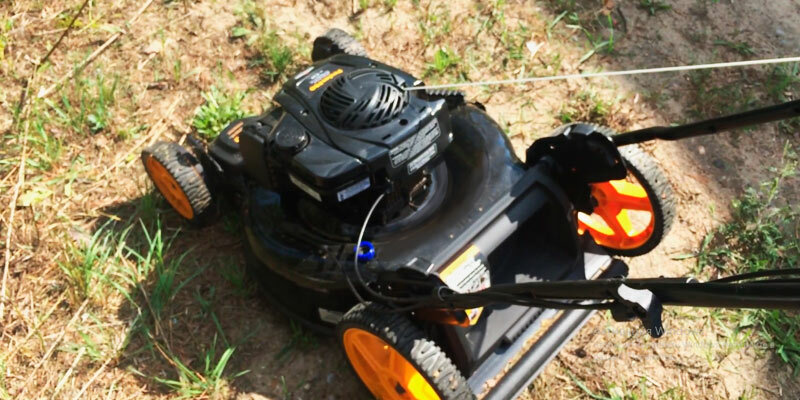 This lawn mower will be the best gardening tool for lawns up to 1 acre. 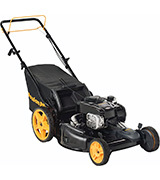 This lawn mower comes with a pull starter and special technologies to ensure easier engine start. 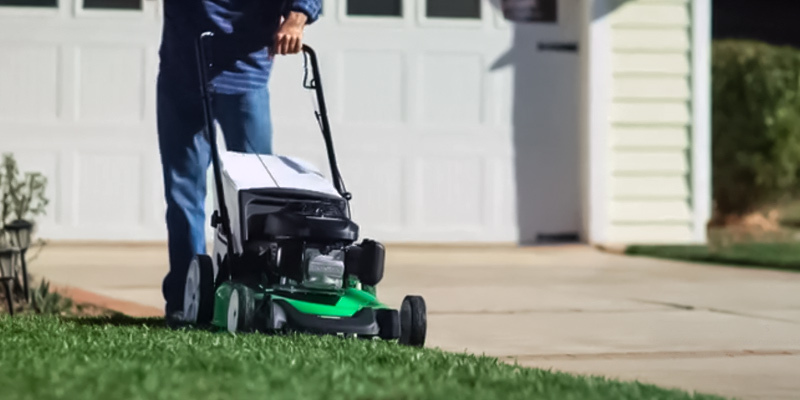 The ReadyStart® starting system automatically senses the engine temperature and feeds the right amount of air and fuel each time you go to mow. Thanks to the S2 Start Guarantee®, the engine is promised to be replaced by the manufacturer in case it fails to start after two sequent pulls. 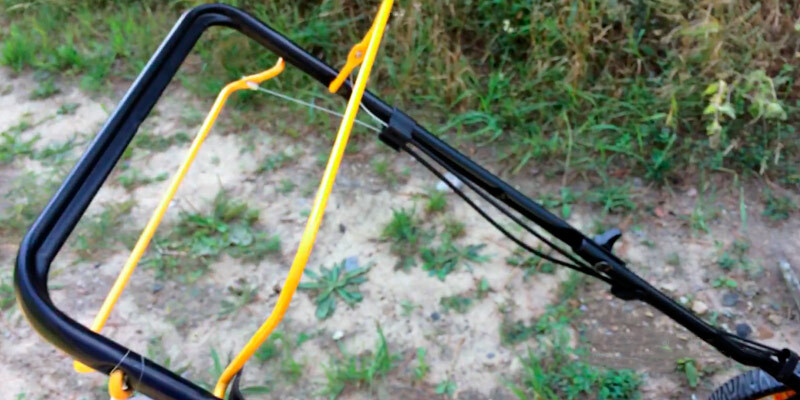 The handlebar can be adjusted to 3 positions, so you can set the height most suitable for you. Besides, you can connect a water hose to clean the blade and deck interior from grass clippings when work is done. The Lawn-Boy 10734 is equipped with 4.4 HP engine manufactured by Kohler. This engine embodies the light weight and high performance. 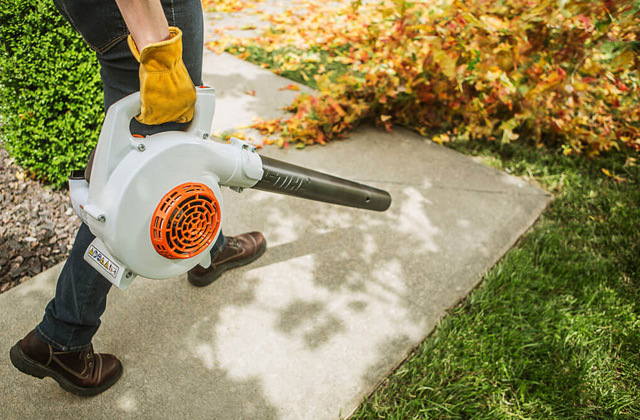 This combination allows you to trim any lawns, including the toughest ones. Owing to the rear-wheel drive, you can work comfortably and effectively on large lawns with multiple obstacles like trees or shrubs. Having a great ground grip, the wheels won't slip on the grass wet with dew or raindrops. 7" front wheels and 8" rear wheels ensure easy propelling on bumpy lands and let you shunt between shrubs ably. This lawn mower comes with a big grass bag which capacity is 2 bushels. This is a rather capacious bag and so you won't need to clean it frequently. 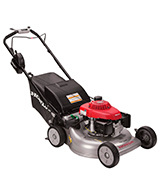 The 21" cutting deck and the speed of 4 mph allow you to quickly trim lawns from 0.25 to 0.5 acre. The Tri-Cut cutting system provides a great mulching capability, so the soil is easily fertilized after mowing. Additionally, you can set the front and the rear axis to one of the 6 cutting height positions from 1.25" to 3.75", to achieve a startling look of your lawn. The Lawn-Boy 10734 features an electric starter, hence you can run the engine by a single turn of a key. The supply package includes a battery charger, using which you'll be able to progress with mowing for quite a while. Still, in case you forget to charge the battery or the charger gets out of order, you can start the engine with a recoil starter. The ground speed can be varied from 0 to 4 mph with the drive bar; the more you release it, the less speed it drives at. The handle can be set into 2 positions for your comfort of use. 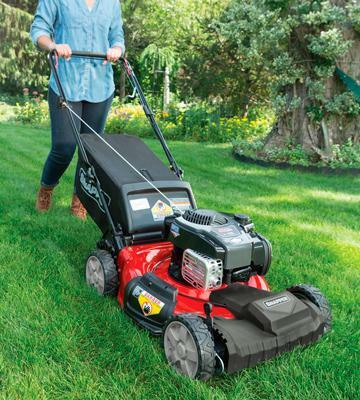 This self-propelled petrol lawn mower features the Briggs & Stratton engine of 725EXi OHV series. The high torque of this engine provides a high performance with 4.8 HP. The engine of the kind allows users to sweep away not only grass but high weeds and saplings as well. The rear-wheel drive provides an excellent grip with any type of grass, wet and dry alike. Both front and rear wheels have an 8" diameter and provide marvelous mobility on rough terrains. 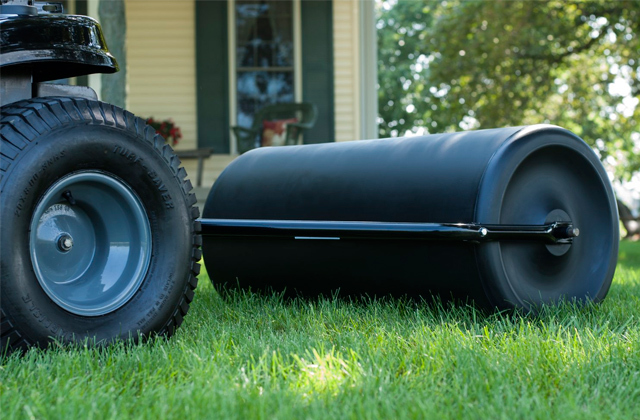 The blade of this self-propelled lawn mower covers a lot of lawn 21" wide, so the mower can put small and medium-sized lawns into a good tilth pretty quickly. For your convenience of use, the cutting height can be adjusted in the range from 1.25" to 3.75" with one lever. This useful option allows for trimming various types of grass and grooming the lawn neatly and accurately. The specially designed blade and cutting deck guarantee effective mulching, so more grass will be bagged. The clipped grass is collected in a 1.9-bushel bag that is easy to remove and empty (when it's full). The mower can propel reaching the speed up to 3 mph, thereby providing effective mowing of lawns up to 0.5 acre. The ReadyStart® technology provides instant and easy engine start with the first pull of a starter rope. If two pulls yield no results, the manufacturer guarantees to repair their engine free of charge within the warranty period. The mower's deck and blade get clogged with grass after mowing, so the cleaning is inevitable. Not to worry! 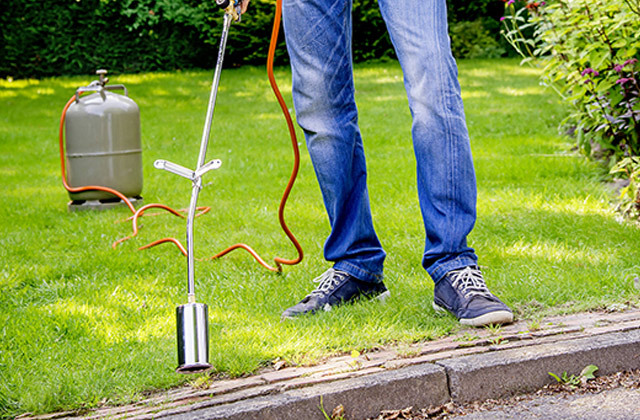 Just connect a garden hose to the deck and pump the water; the mower will be clean in a few minutes. 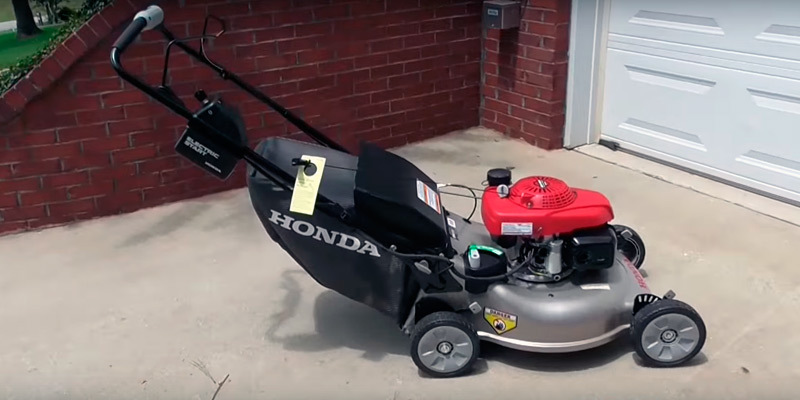 Put the mower in a garage or a storeroom, fold the handle up, and you will get some free space for disposal of other must-haves. The 11" rear wheels provide exceptional stability and passing ability of the Snapper SP80. The front-wheel drive makes the handling easy and improves stability of the machine as well. Accordingly, this model can be used to mow lawns overspread with trees or and other multiple hurdles, like walkways and garden benches. The high-production engine provides 4.8 HP to propel the blade for fast and comfortable cutting of grass and large weeds. 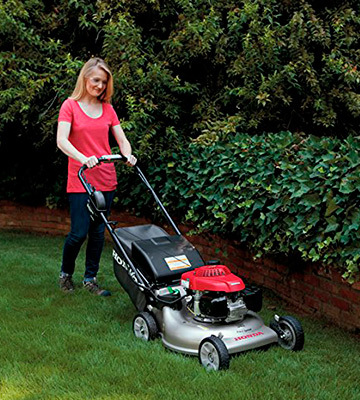 This self-propelled petrol lawn mower features a variable cutting height from 1.25" to 3.75" to adjust to 6 cutting height positions. This option allows you to select the best height for any specific type of grass. 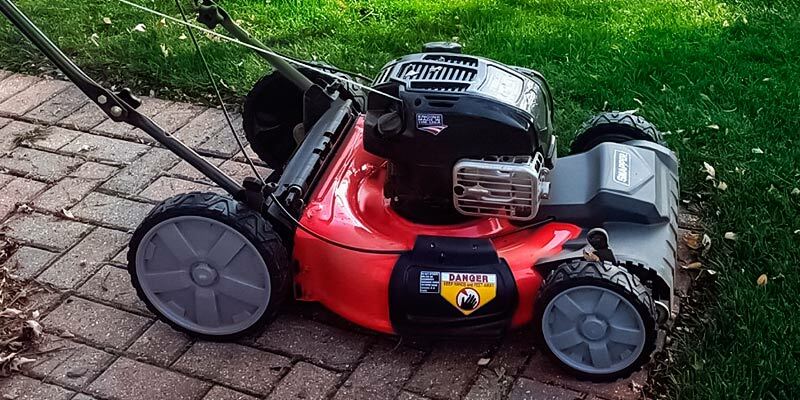 Being equipped with a 21" cutting blade and reaching the ground speed about 3.5 mph, the mower can sweep the grass away on a land of 0.5 acre. The capacious grass bag can hold 1.9 bushel of the shredded grass, which may be enough for several mowing cycles without the need for cleanup. The handle of this lawn mower can be set to 3 positions, so it can be customized to the height of any user. 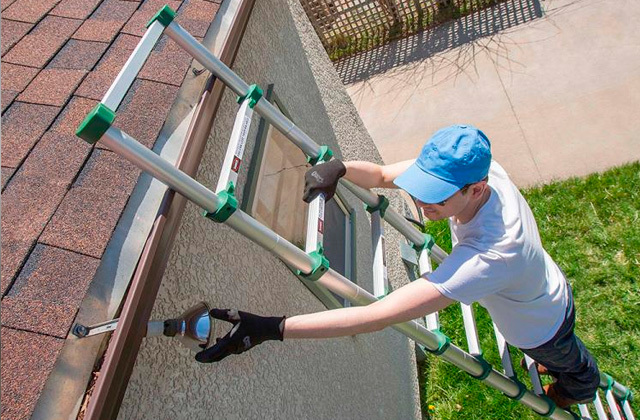 The handle is also covered with a soft and moisture-absorbing material that prevents its slipping and dampens vibration. This all ensures comfortable and effortless mowing. 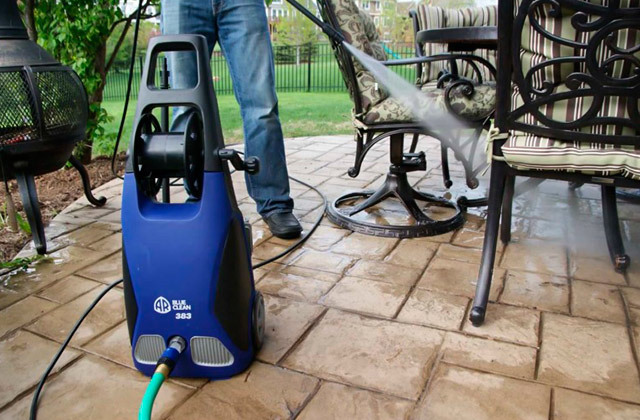 The deck is fitted with a washout port for cleaning the mower off grass with a jet of water. 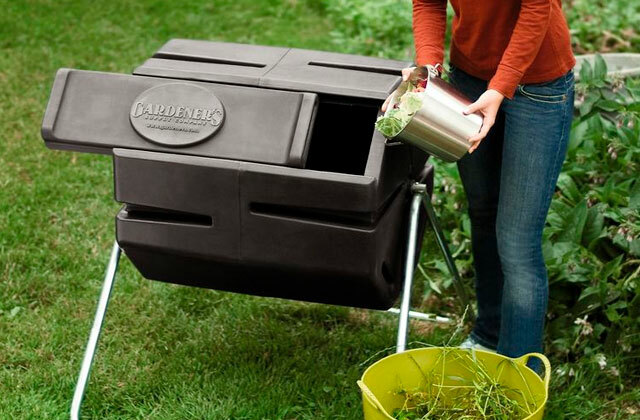 The handle can be folded, so you can keep the mower in a garage or carry it in a trunk or a trailer. Everybody knows that lawns need trimming and grooming. The lawn mowers are up to cope with this job worldwide. 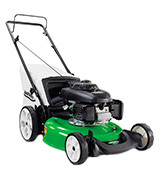 There are several types of lawn mowers designed for specific tasks. The self-propelled lawn mowers are among them. These mowers differ from other models by self-propelling design; they just need guidance, not pushing. The range of application of self-propelled lawn mowers is rather wide and they can be used for any lawns. Still, the best they do when they cover lands from 0.25 to 1 acre. If you need to groom a small-sized lawn, we advise considering push lawn mower or electric lawn mower. 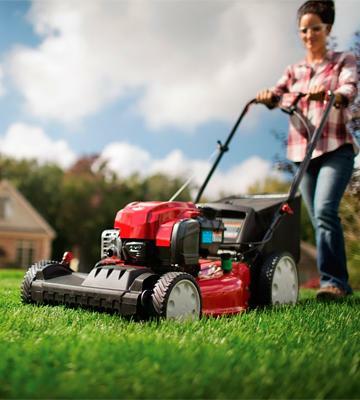 Yet, if your yard is more than 1 acre, pay attention to high-performing riding lawn mowers. 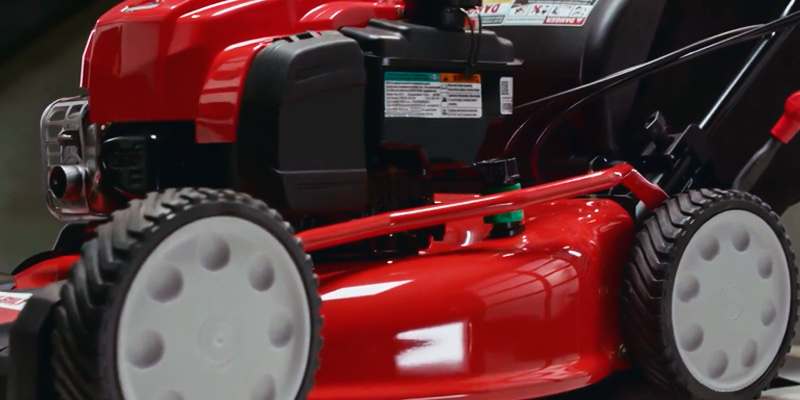 When you choose a self-propelled lawn mower, pay your attention to driving features. Self-propelled lawn mowers may have front-wheel drives, rear-wheel drives, and four-wheel drives. So, you should pick a model based on the terrain. The four-wheel drive models are more affordable and suit the level terrains and lands with many obstacles since you can easily lift and turn such a mower by hands. The rear-wheel drive models are more appropriate for hilly lands and slopes since the rear wheels bear the center of gravity. Such lawn mowers offer a good ground grip; however, maneuvering is far more difficult. The four-wheel drive models are highly mobile and are able to handle various kinds of lawn. Unfortunately, such models are very few and they are more difficult to control. The maneuverability depends on a diameter of wheels. The large wheels surmount bumps and pits better, while the small ones allow maneuvering between multiple obstacles. 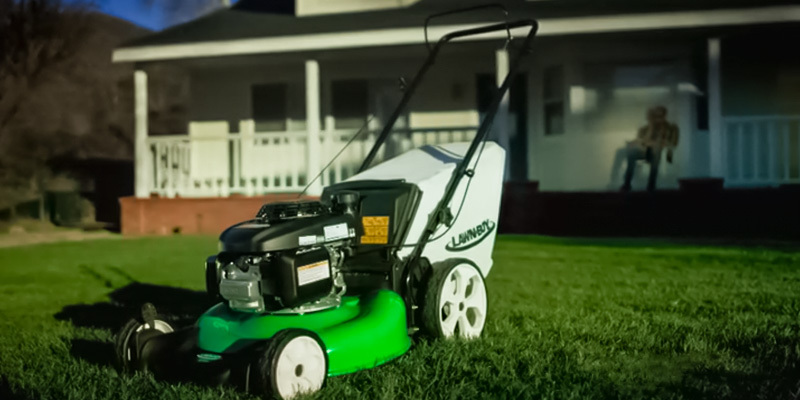 The engine power determines the type of lawn a mower can handle. 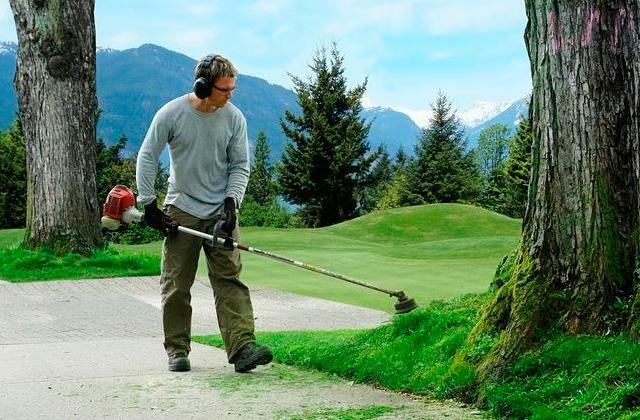 The low-power lawn mowers cope with soft grass well and consume less fuel in comparison with high-performance models, while more powerful lawn mowers are capable of grinding weeds and even thin twigs without hitches. 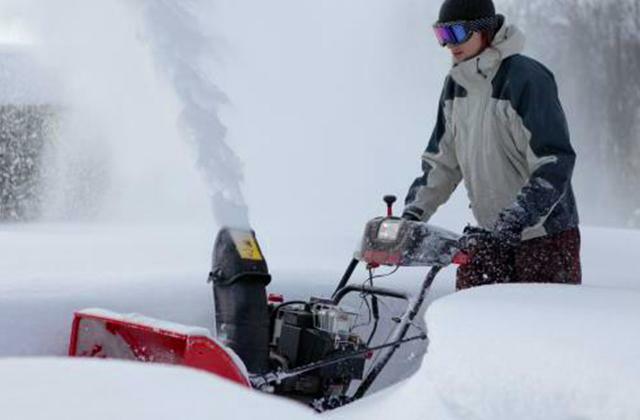 Performance is one of the most important aspects of any lawn mower, and it depends on several parameters. The size of cutting deck defines the amount of grass you can trim per one sweep. The longer the blade is, the faster the cutting will be, though the models with shorter blades are more mobile and can mow in narrow places. 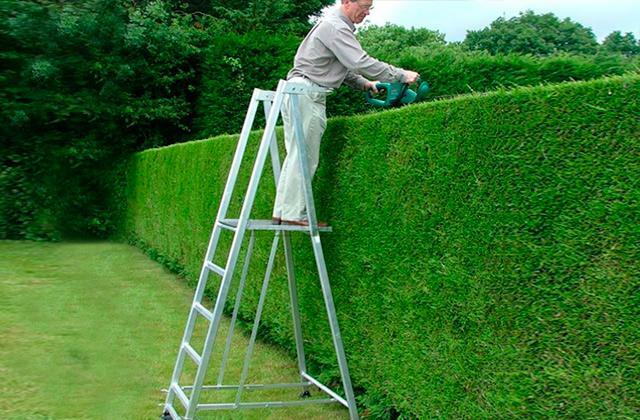 The cutting height adjustment will let you pick the appropriate height for your lawn. The more capacious grass bag your lawn mower features, the longer you can work without cleaning, yet, consider that a bag full of wet grass may add weight to the unit and make it operation more complicated. Lastly, a mower travel speed will determine the amount of your time and effort required to mow your lawn. Finally, you should pay attention to technologies and features that enhance the usability of a lawn mower. Currently, there are lawn mowers featuring electric start; their engines are started with a turn of a key, just like cars. The models equipped with a pull start are run via a recoil starter, and you should pay attention to accessories facilitating this process. The speed variability will provide a comfortable mower guidance and you won’t have to run behind. The models with adjustable handles allow for customizing their height to your needs. The rubber or foam coating on a handle provides comfort when you use a mower for a long time and prevents slipping. The foldable design of a handle allows for a convenient storage and transportation. Besides, some models feature special ports for a connection of water hoses to wash decks from grass clippings.